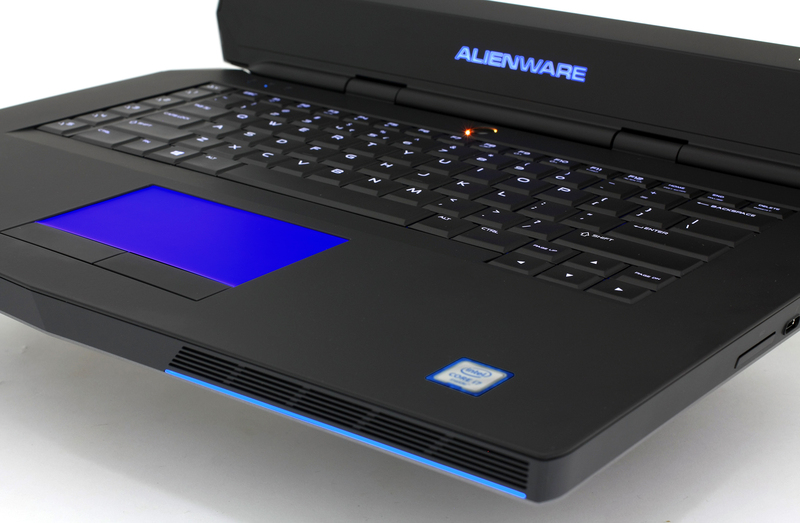 We all know those bulky and heavy gaming notebooks that have all the horsepower needed to power up the latest games, but what if we told you that Alienware has put all the top-shelf hardware from NVIDIA and Intel and put it in a smaller 15-inch form factor notebook? 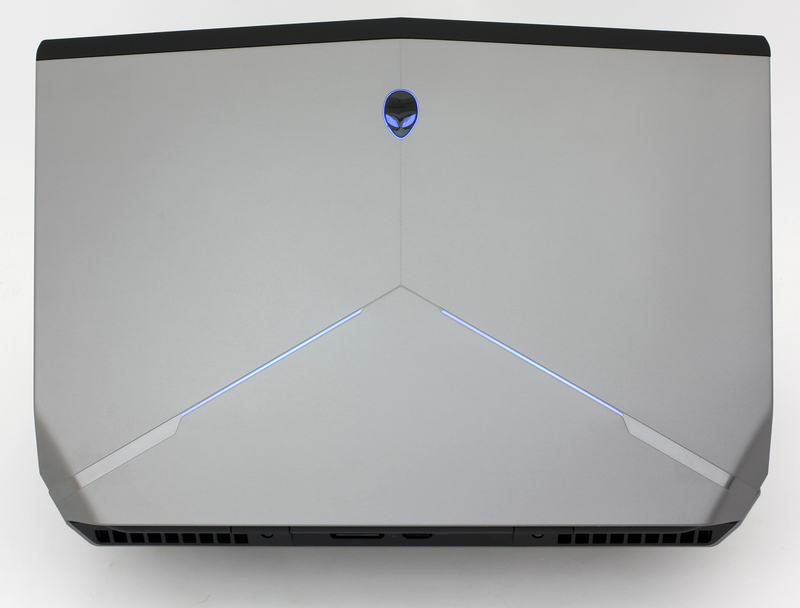 Hard to believe it, but when we first reviewed the new Alienware 15 gaming machine, we didn’t know what Dell has in stored for us. 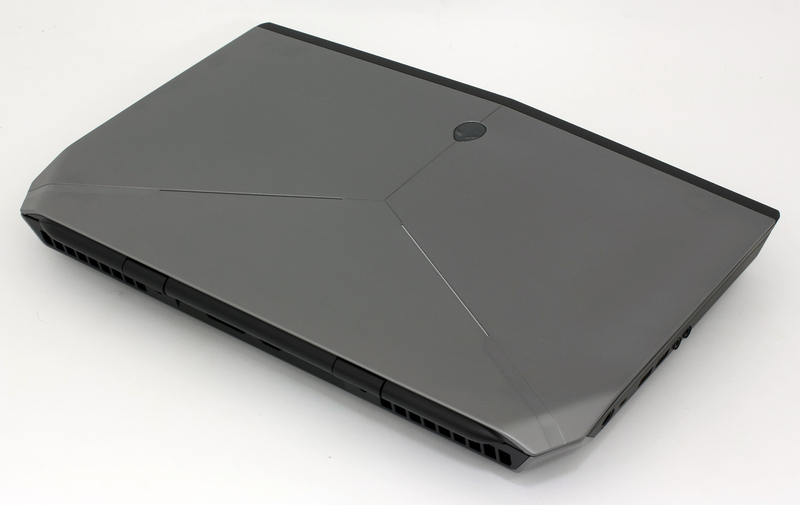 A few months later we are testing the Alienware 15 R2 with top-tier quad-core Core i7-6700HQ CPU and rarely seen in a 15-inch devices – NVIDIA GeForce GTX 980M GPU. Not only that, but the machine offers a fair amount of storage options – one 2.5-inch HDD/SSD slot, which is occupied by a 1TB (7200 rpm) HDD and two M.2 NVMe PCIe SSD slots (one is taken by a 256GB 2280 standard). You can either expand your storage by a lot or use two M.2 SSDs in a RAID 0 configuration. 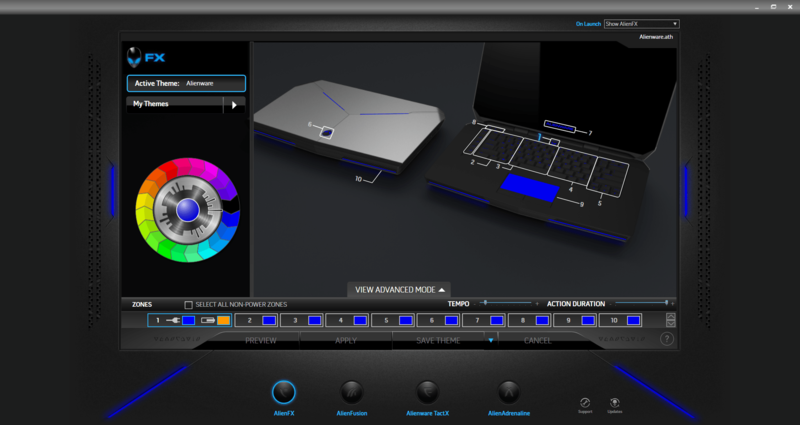 And of course, all of the cool LED lights on the keyboard, touchpad, logos, and lines are customizable in numerous combinations and patterns. But we’ve talked about that in detail in our previous review. Here, however, we are going to stress on the performance and the cooling system. Last time the latter did well with the Core i5 CPU and GeForce GTX 965M, but what about the more powerful Core i7 CPU and much more demanding GeForce GTX 980M GPU? It will be interesting to see how it handles the extra heat and, of course, show you what’s all the fuzz about the so-called Alienware Graphics Amplifier. 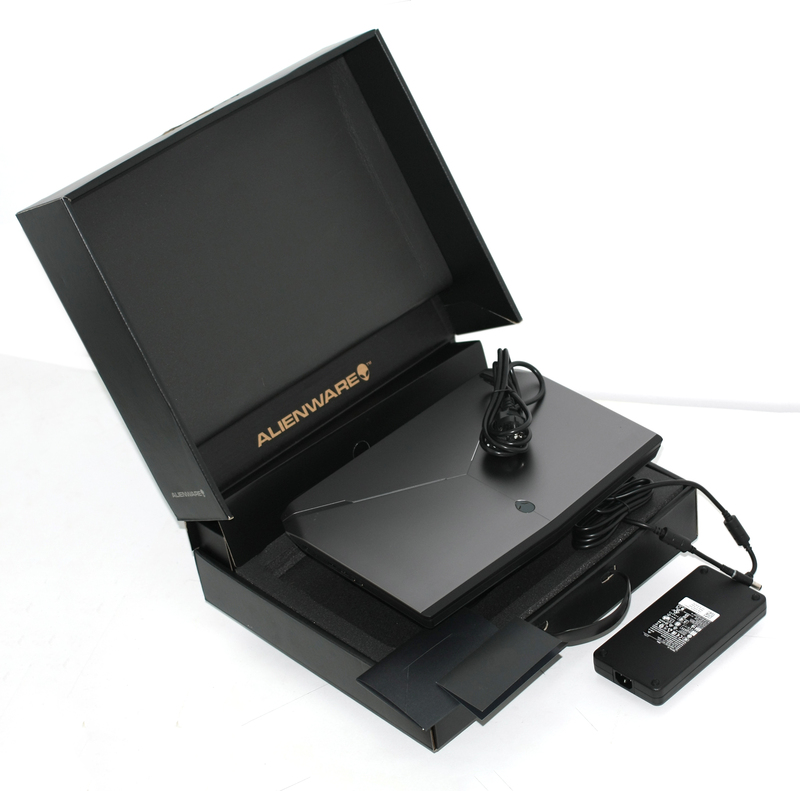 The notebook comes in a big, luxurious box with the usual user manuals, AC charger, charging cable and the notebook itself. The design hasn’t been changed since the previous version at all. It has the same sleek and aggressive looks with premium build quality using aluminum, soft-touch plastic and fiber glass construction on the inside. The lid is covered in metallic gray anodized aluminum with LED lights and Alienware’s logo on top. The edges at the back are curved and seamlessly “connects” to the lower aluminum plate. On the other side of the lid is located the 15-inch Full HD matte display with relatively thin bezels and the HD webcam on top. As usual the LED Alienware logo is there too, but the hinges feel a bit overtightened as the lid has to be opened with two hands because the base flops on the desk if you don’t support it with one of your hands. The lower part of the notebook includes four thick silicone legs that keep the notebook in place and a big vent for extra airflow and can be paired with a cooling pad. The sides of the notebook feature the same soft-touch matte plastic that we find on the inside, but with the loudspeakers placed at the front and two LED stripes complimenting the design signature and giving a rather distinctive look of the machine. The left side has two USB 3.0 ports, DC charging port, and two 3.5 mm audio jacks for external microphone and headphones. This leaves the right side with another USB 3.0 port, LAN port, and SD card reader, but the big surprise here is the USB Type-C that supports USB 3.1 standard and can be used for ultra-fast data transfer or as a connector to an external display. Dell has swapped the usual mini DisplayPort with the USB Type-C connector this time around. The back of the notebook, however, is slightly more interesting. 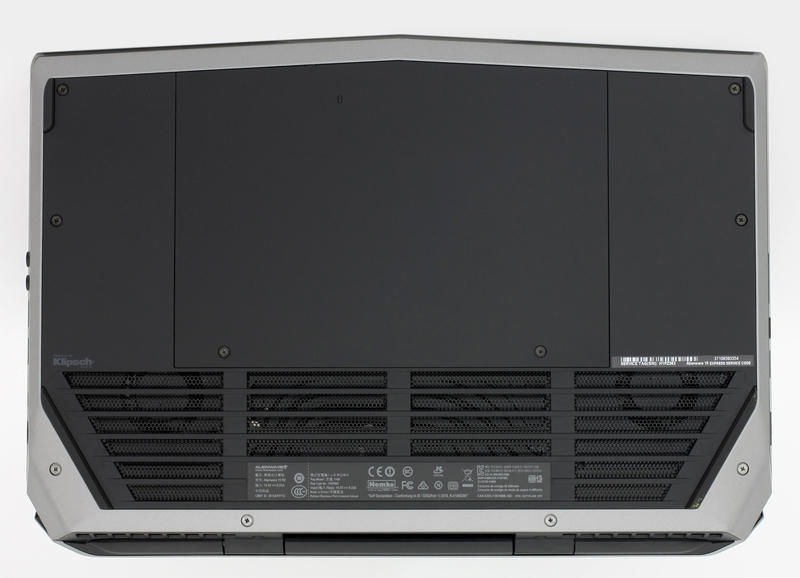 We’ve got two exhaust vents for dispersing the heat, but in the middle we find one HDMI port and one dedicated connector for the Alienware Amplifier. Opening the lid reveals the interior that just shines through the darkness with different LED customizable zones. 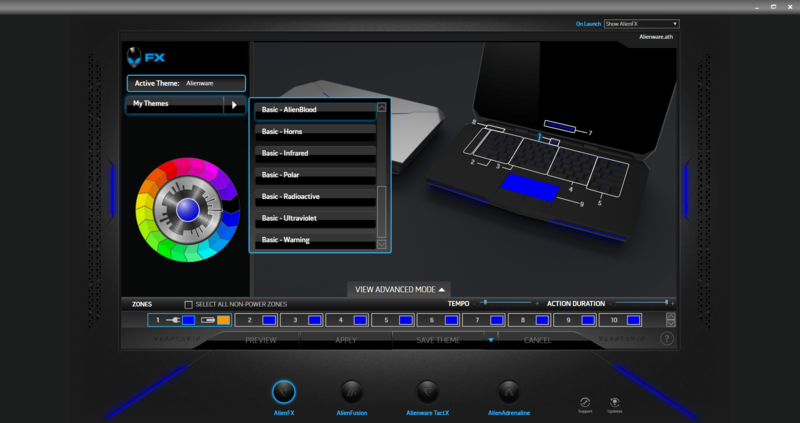 The keyboard alone has three zones that can be adjusted while the touchpad lights up in different colors as well. We already mentioned that the keyboard seems fine, but maybe a little bit too small even for a 15-incher. Other than that, Dell has included the usual macro buttons and the keys have long key travel. As for the touchpad, we have no complaints there – the dedicated mouse buttons feel great with long tactile feedback and while the surface of the trackpad is quite attractive, it does its job well too. All swipes, gestures and taps are registered correctly. The whole construction of the notebook feels robust, looks premium, but the ultimate price is that the machine weighs the eye-popping 3.207 kg and has a 34 mm profile, so it’s not meant for frequent moving. Given all of the hardware crammed inside, cooling system to support it, and the rigid construction, we can let it pass. The main service cover grants access to the most common hardware to upgrade – RAM chips, 2.5-inch HDD/SSD and two M.2 NVMe SSD slots (one is occupied by a 256GB Samsung 2280 M.2 NVMe SSD in our case). But the full disassembly of the notebook isn’t as easy as detaching the service cover. You can read all about it here since the steps needed for the full disassembly of the machine match the ones for the earlier version of the laptop. 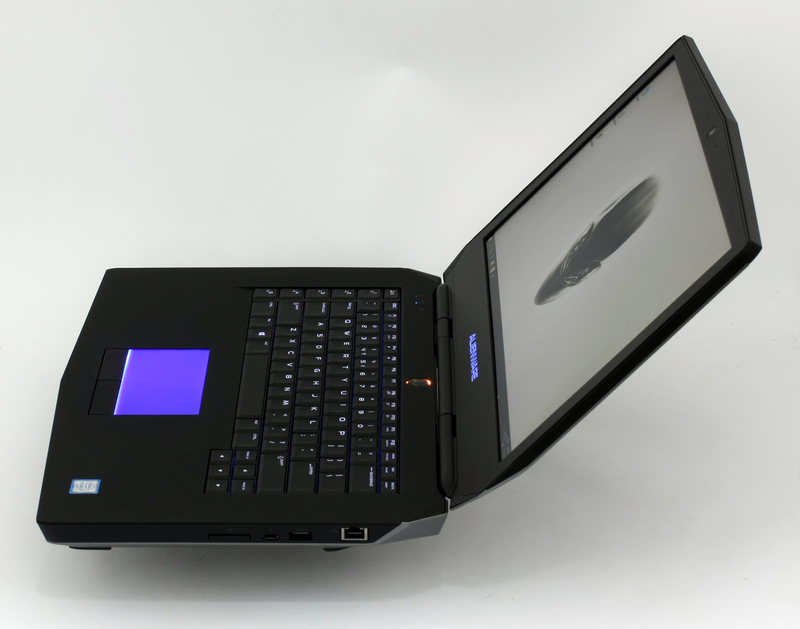 Alienware 15 R2’s display uses a Full HD IPS panel with 1920 x 1080 resolution packed inside a 15.6-inch diagonal. The matrix is manufactured by Samsung with model number 4NDDJ_156HL (SDC4C48). This leads to a pixel density of 141 ppi or 0.18 x 0.18 mm pixel pitch. It can be considered as retina if viewed from a distance equal or greater than 61 cm. Due to the IPS panel used inside, viewing angles are excellent as you can see from the image below. We recorded somewhat low maximum brightness – 200 cd/m2 with a maximum deviation of 9%. It will be more than enough well-lit rooms, but if there’s a big light source behind you like a bright lamp or sunlight coming through the window, images might not appear as clear as it should. 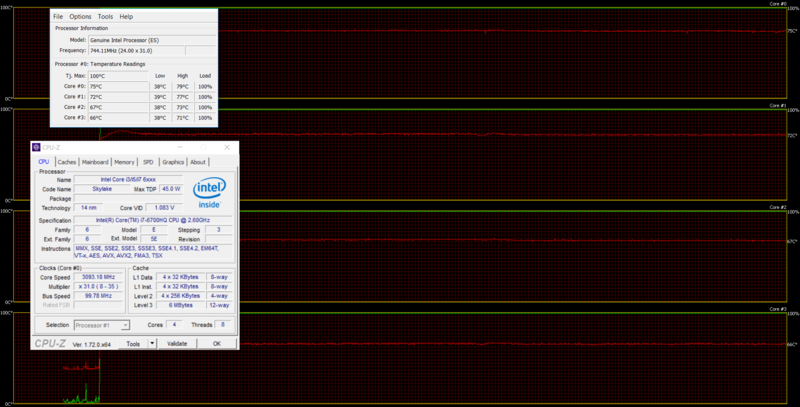 Anyway, the color temperature of 6300K is close to optimal (6500K). To put things into perspective, we would like to give you a little introduction into the sRGB and Adobe RGB color gamuts. The CIE 1976 Uniform Chromaticity Diagram represents the spectrum of colors visible to the human eye, thus giving you a better perception of color gamut coverage and color accuracy. Inside the black triangle, you will see the standard color gamut (sRGB), used by millions of people in HDTV and on the Web. As for Adobe RGB, it is used to work with professional cameras and monitors when preparing print. Basically, colors inside the black triangle are used by everyone, and so reproducing them accurately is key in a quality display. Interestingly, the panel used here doesn’t impress us with wide sRGB color gamut coverage, because it can reproduce only 52% of the colors. That’s way worse than our previous tests on the Alienware 15 with GTX 965M GPU. The graph below is the same but with recorded results – the one on the left is pre-calibration while the one on the right is after. The colored circles represent the reference colors, the white circles being the result. You can see the main and additional colors with 100% and 50% saturation inside the sRGB gamut. We tuned the display at 6500K color temperature and 140 cd/m2 screen brightness. We used X-Rite i1Display Pro as a hardware calibrator. The gamma curve aligns with the optimal one after the calibration. We tested the display using 24 commonly used sample colors like skin tones, grass, blue sky, orange etc. After profiling the display had an average DeltaE 2000 of only 0.94, while the contrast was 840:1 before calibration and 780:1 after. It’s not what we’ve expected really, but it’s acceptable. The histogram shows the accuracy of other colors as well. 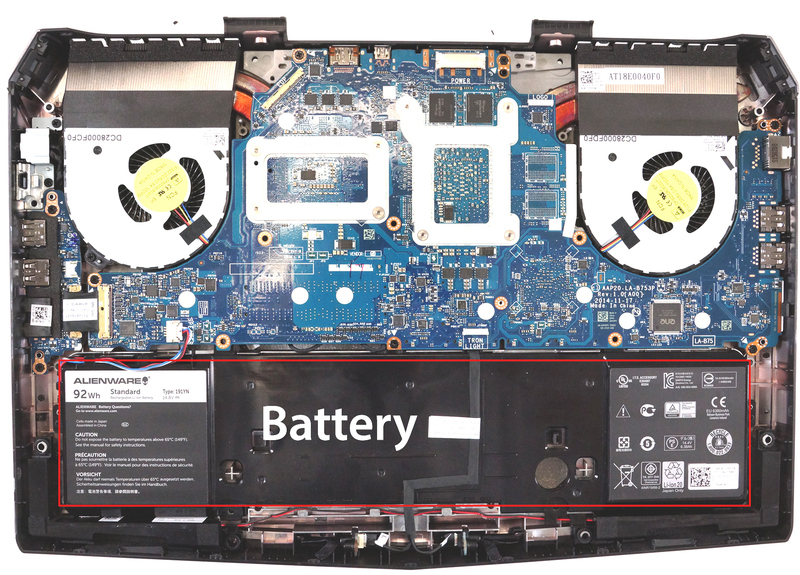 We were pleased to see that the new Alienware 15 R2 doesn’t use PWM… most of the time. Our oscilloscope recorded pulsating light only at 54 cd/m2 screen brightness or in other words 25% or in other words – unusable. So if you aren’t in a completely dark room or basement, most likely you will not use the display at 54 cd/m2. But it’s strongly advisable that you keep the brightness above 25% because the frequency of the emitted light is only 200 Hz and it’s considered as “aggressive” pulsation. Most of the notebooks we’ve reviewed offer either good picture quality and have PWM or the latter isn’t present at all. But this is one of those rare cases in which the screen quality is mediocre, but it’s harmless to your eyes. We also suspect that Dell has taken this a bit too seriously because the blue light emission is greatly reduced but, of course, this has resulted in low sRGB color gamut coverage of only 52%. We can’t be sure whether this is the root of this change or something else, but the fact still remains – this notebook offers below average screen quality for machine expensive as this one. Moreover, the maximum brightness of 200 cd/m2 will be a problem for those using the notebook near a big light source or near the window. It will still be fine for gaming, watching movies and browsing as it offers relatively high contrast ratio and excellent viewing angles. For some time now, we’ve been testing displays with low blue light emissions due to the increase in eye health problems that emerged thanks to the blue light that has a wavelength of 430 nm. You can make a quick check with Google about “macula cancer” and see all the disturbing images that are displayed. Even if a part of the research about the harmful blue light turn out to be true, it’s a logical thing to do as a manufacturer and replace the panel of the product with a more user-friendly screen. On the other hand, we are a bit skeptical about this change. If Dell’s intentions were good, then why didn’t this small, but notable change, didn’t make it into their marketing ads of the product. While it may reduce the harm of the blue light, we are still left with mediocre screen quality in a high-end product. For the record, you can always download a nifty software called “f.lux” that reduces the harm from the blue light, especially when you tend to work at night or just pulling all-nighters playing games with your friends. Either way, users should be aware of this significant change and be presented with a choice. 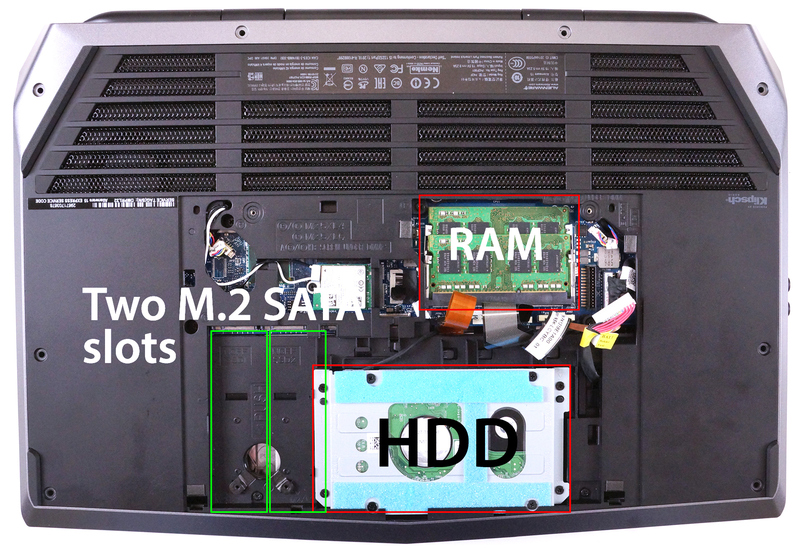 And, of course, Alienware should have tackled this problem another way without sacrificing image quality. If we assume a distance of 58cm (~23in) between the human eye and the notebook monitor, then normal (20/20) vision would require a pixel density of at least 150ppi in order to interpret an image as perfectly detailed. Higher panel brightness is of key importance for visual comfort when working outside or in a brightly lit room. Delta E is a CIE measurement unit of color difference. Higher values indicate that the display produces less accurate colors. (lower results are desirable). The sRGB color gamut, introduced as a standard for the Web, shows the percentage of colors used on the Web that can be displayed on the screen of the device being tested (higher values are better). The sound appears to be clear and our tests show that the sound system is able to reproduce sounds in the range of +/-6 dB. We can only assess it as an excellent result so be sure that you will receive a high-end loudspeakers. The specs sheet provided below is for the model used in this review. Hardware specification may vary depending on your region. The Alienware 15 came with pre-installed Windows 10 with all the drivers needed for it to work properly. 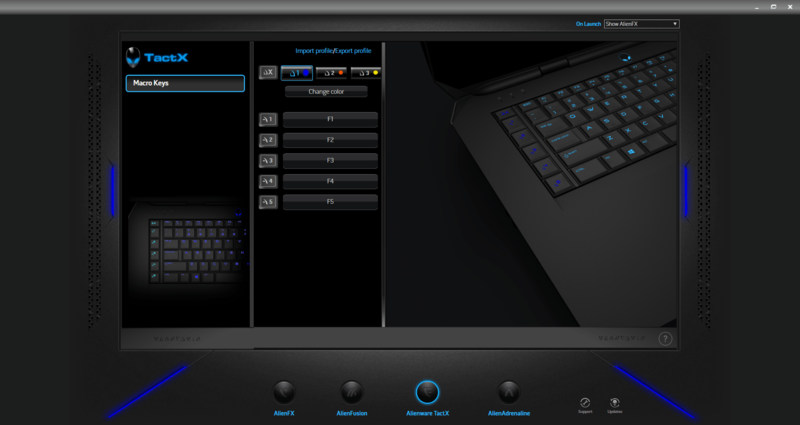 Also, Dell has included a cool software called Command Center that lets you monitor the performance of the machine, control and customize the LEDs on the chassis and, of course, set up your macro keys on the keyboard. 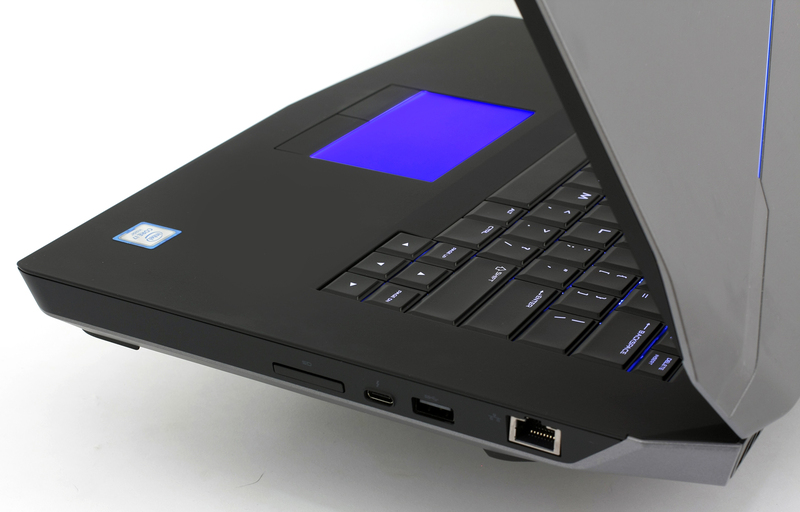 The notebook houses a huge 8-cell 92Wh battery, but it’s understandable given the demanding hardware and thick body. Since this is a gaming notebook, we cannot expect exceptional battery life. Anyway, we ran our usual scenario of testing with Wi-Fi browsing, gaming and video playback with 120 cd/m2 screen brightness, power saver mode on and Wi-Fi turned on. In order to simulate real-life conditions, we used our own script for to automatically browse through over 70 websites. Definitely a good result for a gaming notebook – 375 minutes (6 hours and 15 minutes). Slightly lower, but still good readings on the video playback test – 360 minutes (6 hours). For accurate simulation, we used the Metro Last Light benchmark running on a loop with graphic settings set to minimum. It’s not likely that you will start a gaming session away from a power source but if you do so, you will get 171 minutes (2 hour and 51 minutes) of play time. Intel Core i7-6700HQ represents the Skylake H family and it’s considered a high-performance chip with high voltage – 45W TDP. This is a step down from its direct predecessor – Core i7-4700HQ, but matches its short-lived predecessor Core i7-5700HQ. The Core i7-6700HQ has four cores ticking at 2.6GHz and can go up to 3.5 GHz for one active core and 3.1 GHz for four active cores. The silicon supports the so-called Hyper-Threading technology that emulates one virtual core for each physical, thus establishing a total of 8 threads. Furthermore, the chip is manufactured using 14nm FinFET process and integrates Intel HD Graphics 530 GPU with 24 EU (Executable Units) clocked at 350 – 1050 MHz. The memory controller supports up to 64GB of DDR3 or DDR4 RAM at 1600 or 2133 MHz respectively. The CPU is suitable for heavy applications and gaming. Here you can see an approximate comparison between the CPUs that can be found in the Alienware 15 R2 models on the market. This way you can decide for yourself which Alienware 15 R2 model is the best bang for your buck. Fritz is a chess benchmark that tests the computing capabilities of the CPU with various chess moves. The Intel Core i7-6700HQ managed to reach 12.467 million moves per second. By comparison, one of the most powerful PCs, Deep(er) Blue, was able to squeeze out 200 million moves per second. In 1997 Deep(er) Blue even beat the famous Garry Kasparov with 3.5 to 2.5. NVIDIA GeForce GTX 980M is a high-end graphics chip, announced on October 7, 2014. It will be available in models with up to 8GB of GDDR5 memory. NVIDIA GeForce GTX 980M uses the Maxwell GM204 architecture and has 1536 CUDA cores. All of them operate at 1038MHz, but NVIDIA’s GPU Boost 2.0 can dynamically increase that frequency. The graphics card has a 256bit bus and supports DirectX 11.2, Pixel Shader 5.0, Optimus, SLI, PhysX, OpenCL 1.1, OpenGL 4.4, DirectCompute, CUDA, Blu-Ray 3D and 3D Vision. Memory bandwidth is 160GB/sec. Max resolutions (WxH) are 3840×2160 digital and 2048×1536 analog. Here you can see an approximate comparison between the GPUs that can be found in the Alienware 15 R2 models on the market. This way you can decide for yourself which Alienware 15 R2 model is the best bang for your buck. Note: The chart shows the cheapest different GPU configurations so you should check what the other specifications of these laptops are by clicking on the laptop’s name / GPU. While this two-staged test doesn’t represent real-life usage and such loads cannot be achieved under normal circumstances, it is a really good way to determine the overall stability of the system and how it affects user experience. We start off with 100% CPU load for about an hour and indicated that the silicon runs at 38 °C when idle and went as high as 77-79 °C, which is quite impressive given the load and the duration of the test. Also, the chip was ticking at approximately 3.1 GHz and this is the maximum operating frequency when four cores are active. The notebook ran quite silently. You can see the graph below for additional information – the red line represents the temperatures while the green one stands for the load. After an hour, we ran the GPU stress test as well and as you can see from the screenshot below, things didn’t change a lot. The CPU’s temperature rose to a maximum of 90 °C, which is still away from the maximum one of 100 °C, and caused no throttling. 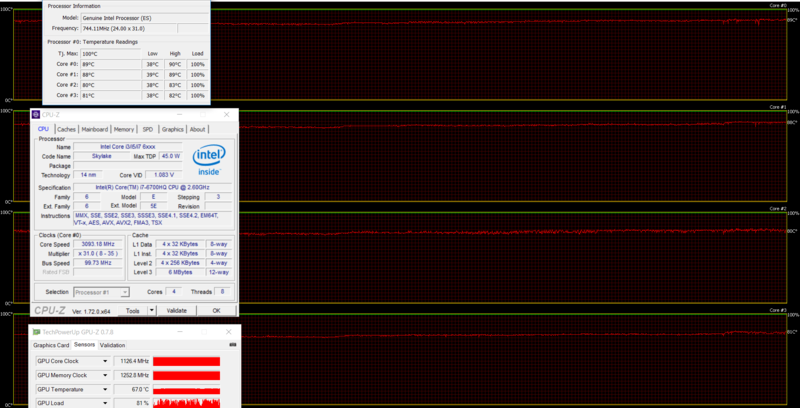 It was working at 3.1 GHz for the duration of the test. The GPU, however, was running at the eye-popping 67 °C. This is an extremely low temperature for a 100% CPU and GPU load in a notebook. While the cooling system keeps the internals really cool, the same cannot be said for the outer chassis. The heat on the left side of the keyboard was manageable, the palm rest area was cool, but the top part of the machine and the center of the keyboard were a bit hotter. 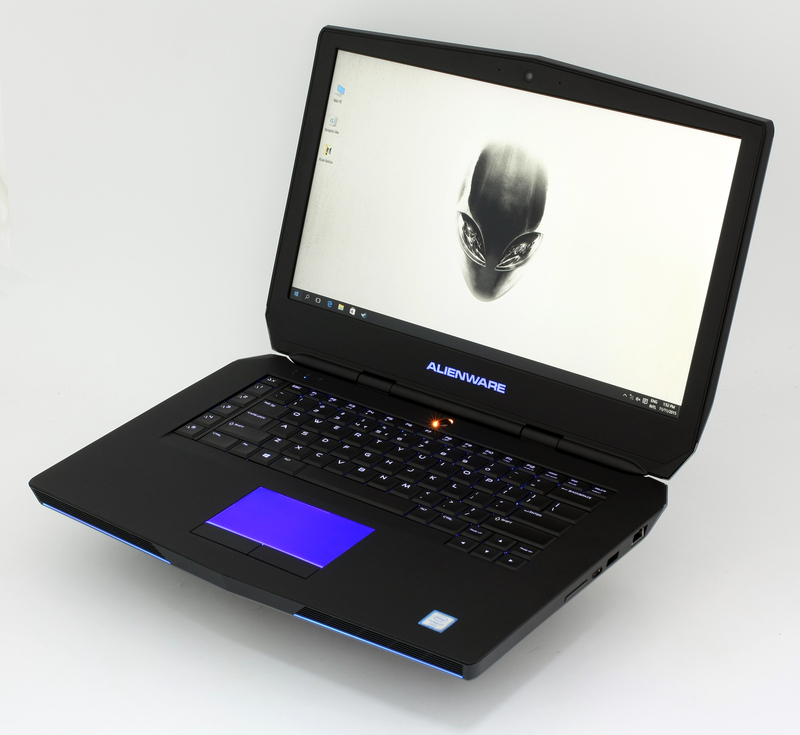 Generally, the Alienware 15 R2 is what we are used to seeing from the brand. The notebook has a bulky and heavy body, but manages to compensate with outstanding design, rigid construction made of premium materials and extremely powerful hardware that’s rarely seen in a 15-inch form factor. We’ve got quad-core Intel i7 CPU with top-shelf GeForce GTX 980M GPU and 12GB of DDR4-2133 RAM for optimal gaming experience. You can also benefit from the speedy M.2 NVMe SSD standard that the motherboard supports. 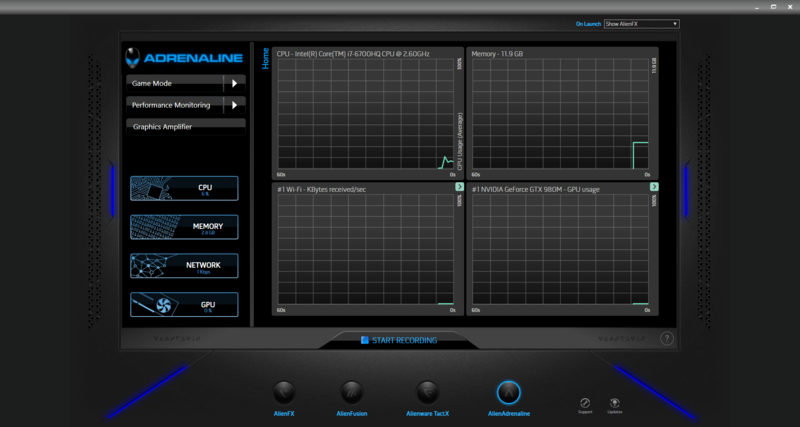 You can even double your speed with a RAID 0 configuration thanks to the two 2280 M.2 SSD slots provided. The latter is enhanced thanks to the flawless sound coming out of the loudspeakers, good keyboard and touchpad with various LED patterns and combinations for you to experiment with. However, there are two major drawbacks that kind of ruin the whole experience. 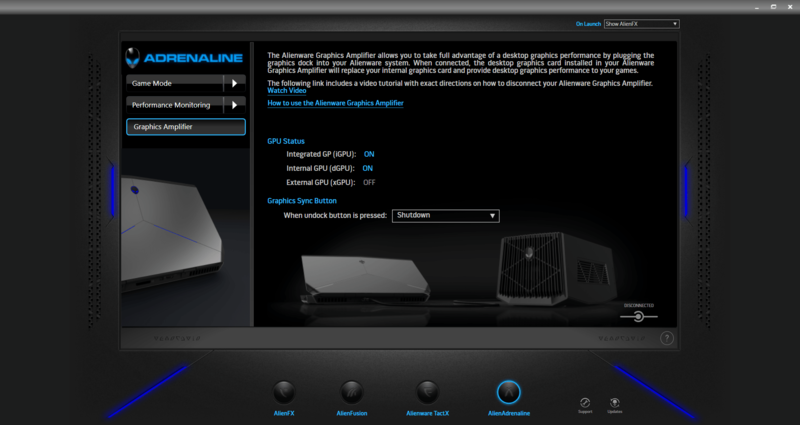 We are definitely not used to such things with the Alienware brand, but we have some guesses why is that. Let’s start with the screen. It features IPS panel with relatively high contrast ratio and excellent viewing angles. Also, it doesn’t use PWM after 25% brightness (keep in mind that anything under around 80 cd/m2 is virtually unusable under normal circumstances, but that’s all actually. The sRGB color gamut coverage is poor and the maximum brightness isn’t satisfying as well. Really surprising results for an IPS panel and this can be a deal-breaker for some. We consider the screen quality below average and this is an important thing to consider when looking for a gaming beast costing around €2 700. On the other hand, we can partially solve the mystery with the lackluster display performance. We suspect that the sRGB color gamut coverage is suffering due to the reduced blue light emissions that cause harm to the macula of the eye. 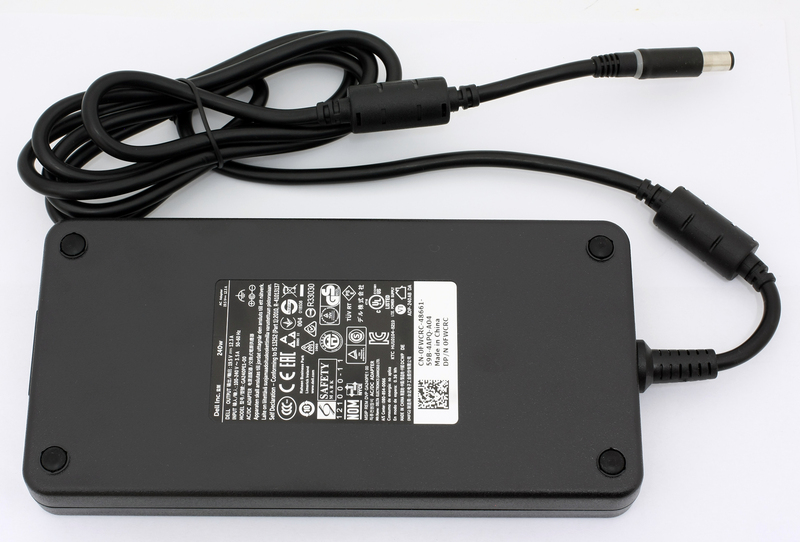 Moreover, the maximum brightness is only 200 cd/m2 which could be a problem for users who will use the notebook near a window or a big light source. And finally we would like to address the cooling system. Last time we’ve checked the thermal​ design was able to keep up with the GTX 965M and Core i5 Haswell CPU, but the same cannot be said with the significantly more powerful hardware presented in the Alienware 15 R2. The GTX 980M takes a toll on the cooling system and raises the temperatures near the center of the keyboard and the top part of the interior. 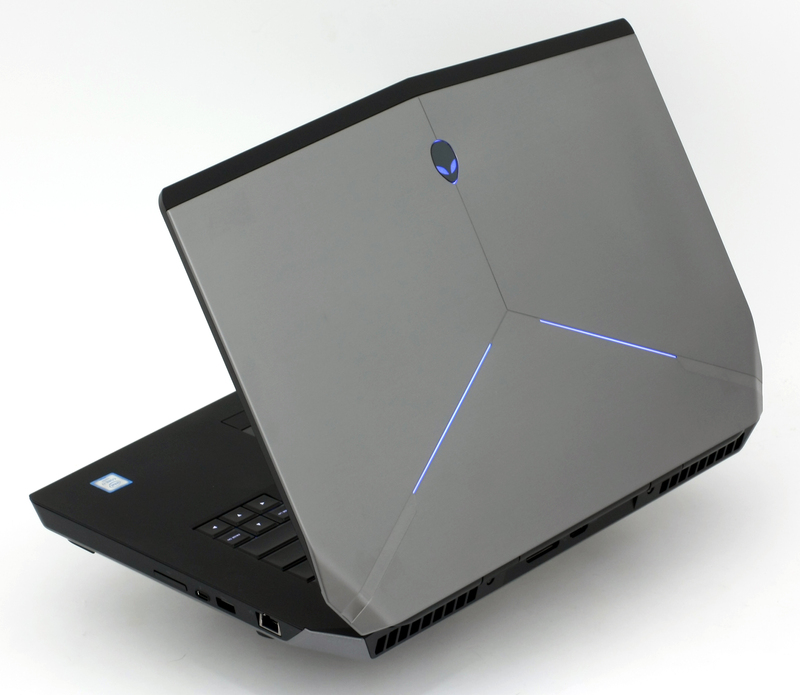 So it looks like Alienware has really pushed the boundaries of the 15-inch laptop and we hope that the next generation will bring some improvements over at the screen department as well. Can you post the color calibration profile? I purchased this laptop and am disappointed with the colors, especially the fact that every seems to be yellow-washed. I’m hoping a professional calibration will help. There is an youtube review which says its over 90% color production, Is that for UHD display ? if so, its worth upgrading for $200 .. what’s your thought…. I just returned a Sager 15.6 (NP9758-S) with the 4k screen because of light leak issues. The screen rim looked like it was pinched in multiple places. I returned it to Sager only to have them send my another screen that looked even worse. I was excited to see Alienware has most of the same high-end specs that I liked in the Sager, but if it’s a problem with 4K IPS screens then I might hold off all together. Why didn’t the review mention light leak? Is it only a problem on the 4K screens?